Introductory Note: This article was originally published in the year 2000. (It has been slightly edited for the internet and we have added numerous things since then). Recent developments, including John Paul II recently being struck so that he could not speak a word or give order concerning the Vatican, and then dying almost immediately after this event in great torment, have proven that this article paralleling the Four False High Priests at the time of the Abomination of Desolation in the Machabees with the Four Vatican II Antipopes was accurate and correct. Recently [in 1999], a Biblical Scholar shared some of the insights and discoveries that he has made over the past 30 years. This article is a collection of what is, in our opinion, some of his most interesting information. Much of what is contained in this article is the fruit of his over 30 years of study. However, out of respect for his request, his name remain anonymous. Returning to the Machabees: we are told that the time period of the persecution and apostasy began with the commencement of the reign of Antiochus “in the year 137” B.C. (1 Macc 1:11). We know from Babylonian archival material that Antiochus began to reign “in the sixth month” of the Seleucid year 137. The persecution period ended with the death of Simon, the last of five sons (the Machabees) of the priest of Modin, “in the 11th month of the year 177” (1 Macc 16:14). So the period of persecution lasted some 40 years and five months. It is worthy of note, I think, to mention at this point, that Christ in the eschatological discourse says: “This generation will not pass away.....” A biblical generation is known to be reckoned as being 40 years long. Anyone familiar with the existing material (which material is clearly pre-Christian) of the Essene sect of the Jews knows that the material speaks constantly of the last battle in the history of the world being 40 years long. I wonder what that could be? Whatever it is, it is now in our past. (Idolatry includes any worship of God that is inauthentic.) Of note is the fact that my “Catholic” Almanac reports that the “Apostolic Constitution” on the Novus Ordo Missae was signed by Paul VI on April 3, 1969 (which was Passover in that year) and that the Novus Ordo was made mandatory in its final form on December 1st, 1974. Now our current reckoning has a strange anomaly; there is no year -0-. We proceed directly and immediately from December 31st, 1 B.C. to January 1st, 1 A.D. This is to say that B.C. events are 1 year less removed from us than the sum total of the two integers. The majority opinion on the year of Christ’s birth is that it occurred 2 to 3 years prior to Herod the Great’s death. Herod’s death date is one of the most certain in all of antiquity, owing to Josephus who states that it took place in the 36th year of Herod’s reign, contemporaneously (at the same time) with a lunar eclipse visible from Jerusalem, which event was followed closely by a Passover. The date of that eclipse and Herod’s death is Tuesday March 13th 4 B.C. at about 1:28 A.M. (Julian Calendar). Further, the triple conjunction of Jupiter and Saturn in the constellation of Pisces in 7 B.C. is understood by the majority of the scholarly community to meet Matthew’s account of the “star” of Bethlehem. This would place the 1980th anniversary of the NATIVITY in our year 1974 A.D. Interesting....minimally for some of us who still have regard for private revelation. For those into detail, the evidence is that “Dennis the little” who is responsible for giving us our present year reckoning, intended to make year 1 of the Christian era the first full year following the year that saw the event of the Nativity of Christ. If the year 7 B.C. was the year that indeed contained the event of the Nativity, 6 B.C. would be the year that Dennis intended (although he didn’t accomplish it) to be year 1, and December 31st 1974 would be the end of the year of Christ 1980. There are some versions of the aforementioned prophecy of Saint Bridget that start, “In the year of Christ 1980...” as though Saint Bridget were drawing a distinction between the true year 1980 and our year 1980, which are not the same. The word “WING” was used by the ancients in much the same way as we use it: the west WING of a hospital, for example. Only one scriptural citation is necessary to prove the point: “....and the right WING of his army with them” (1 Machabees 9:1). The last of these four false High Priests is Alcimus, who in some respects is the most dangerous of the lot because his act is the best. He obtains the appointment as reported in 2 Macc 14:3-4; but he had “willfully defiled himself in the time of the mingling with the heathens, seeing that there was no safety for him, nor access to the altar” (2 Macc 14:3). Bishop Challoner, who is famous for his scriptural notes, states that Alcimus, “for his apostasy here mentioned, was incapable of the High Priesthood....as Menelaus had been before him....yet neither of them was truly High Priest....mingling with heathens, that is, in their idolatrous worship” (2 Macc. 14:3, Douay-Rheims note). It is not my intention to write a commentary on the Machabees, but merely to point out certain parallels with our own age. The syncretism begins with the election of Angelo Roncalli, who takes the name John XXIII. He reports, after his election, and with sarcasm, that his file has been marked “suspected modernist,” as though this were a big joke. Pope Saint Pius X calls Modernism “The Synthesis of All Heresies.” In the magazine, 30 Days, several years ago, the head of the Italian Freemasons proclaimed that John XXIII was one of their number, an active member! The Grand Master of the Grand Orient of Italy stated: “As for that, it seems that John XXIII was initiated (into a Masonic Lodge) in Paris and participated in the work of the Istanbul Workshops.”  I have also seen a sworn affidavit of one of “Cardinal” Roncalli’s (John XXIII’s) French Government body guards, assigned to protect him during the years when he was in France in an official Vatican capacity. He swears that he escorted Roncalli to the Masonic Lodge with great frequency. Now I ask, how does someone who is outside the community (membership in Freemasonry is the subject of automatic major excommunication) HEAD THE COMMUNITY? This is a contradiction in terms. Has been struck with a shaking palsy and is basically unable to speak or give order concerning the Vatican. Died in great torment shortly after being struck so that could not speak a word. In the same scriptural note (2 Macc. 14:3), Challoner explains how the true High Priesthood lay with the Machabees: “...the true high priesthood was amongst the Machabees, who were also of the stock of Aaron, and had strictly held their religion, and were ordained according to the rites commanded in the laws of Moses.” The Machabees held strictly to the traditional faith, and ordained men according to the Traditional Rite. Likewise the true Priesthood exists in those who hold fast to the religion that has been delivered to them, and ordain and consecrate according to the Traditional Rite. Those who have retained the traditional rituals, but yet do not retain the traditional faith or are associated with the abominable Vatican II/New Order Church, do not possess the true faith. The whore of Babylon sits on seven hills. Biblical exegetes generally states that it is ROME, “the great city” of the Apocalypse. Apocalypse 18:3 "Because all nations have drunk of the wine of the wrath of her fornication; and the kings of the earth have committed fornication with her." Apocalypse 14:8 "And another angel followed, saying: That great Babylon is fallen, is fallen; which made all nations drink of the wine of the wrath of her fornication." Apocalypse 16:19 "And great Babylon came in remembrance before God, to give her the cup of the wine of the indignation of His wrath." Apocalypse 17:1-2 "Come, I will shew thee the condemnation of the great harlot, who sitteth upon many waters. With whom the kings of the earth have committed fornication; and they who inhabit the earth, have been made drunk with the wine of her whoredom." To the extent that Rome loses the faith, and hence by definition allies herself or indeed becomes the enemy of the true Church, it becomes guilty of the blood of the very prophets and saints of the true Church of all time. Just as Our Lord was placed in the hands of His enemies during His Passion, Our Lord allows the buildings and infrastructure of His Church to be placed in the hands of its enemies during its passion. On June 30, 1968, the Vatican II sect adopts a new ritual for ordaining priests, as well as a new manner of consecrating bishops, “The fullness of orders.” The new manner is essentially and materially an Anglican ritual, which ritual (the Anglican ritual) was declared by Pope Leo XIII, to not confect the Sacrament of Orders. I am reminded of the “Testimony of Moses” which contains the following line: “in the last days there will be slaves about my altar who are not true priests but slaves.....” We have seen the fruits of their fraudulent “Orders”: pedophiles, homosexuals, and lecherous men, among other things. Many theologians believe that St. Stephen’s martyrdom and prayer was the efficient cause of St. Paul’s conversion. His conversion is said (unanimously) to have occurred very shortly after the death of St. Stephen in 37 A.D. Please notice how inextricably bound up are 1) acceptance that John Paul II is the Pope and 2) the acceptance of Vatican II and the New Mass. If you accept # 1, then you must accept # 2, as this instance proves again. Vatican II is the official Council and teaching of the “Church” of John Paul II, Benedict XVI, Francic I etc. ; and the New Mass is an official rite of the “Church” of John Paul II, Benedict XVI, Francic etc. That is why John Paul II and his apostate “Bishops” will not recognize those persons who don’t accept the legitimacy and validity of these two things as “Catholics in full communion” with them. That is precisely why the SSJV had to accept these things to get full “approval” from the Vatican II sect. 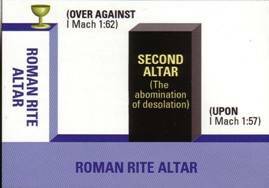 Also see The New Mass and the Abomination of Desolation in order to understand why the New Mass is the prophetic fulfillment of this prophecy.